and all other hand-knotted and machine made rugs. Oriental rugs and other fine rugs are an excellent way to enhance the décor of your home. At New Finish, we specialize in the cleaning and care of fine rugs and should only be handled by professionals with the proper training. The key to successful rug cleaning is to clean it by hand. Hand woven rugs should not be cleaned with powerful pieces of equipment, they should be carefully washed by hand and dried as quickly as possible. Proper cleaning of an oriental rug can not be completed overnight. You should allow about 3 to 5 days for the process to be completed. Please read about the process below to gain a better understanding of what is involved. We will determine as much as we possibly can about the type of rug and inherent qualities that may affect cleaning. We will outline the expected results and cleaning “prescription”. Our company will come to your home to pick up your rug. Woven rugs, especially hand knotted rugs are designed to hide dry soil. (A few years ago, the Eureka Company did a study and found that a 9 x 12 could hide 3 to 5 pounds of dirt!) WOW! We use a variety of techniques to “dust” the rugs from the front and back. A machine called a pile lifter, special vacuum attachments and any many other methods are implemented. This is the most important step in cleaning any textile. 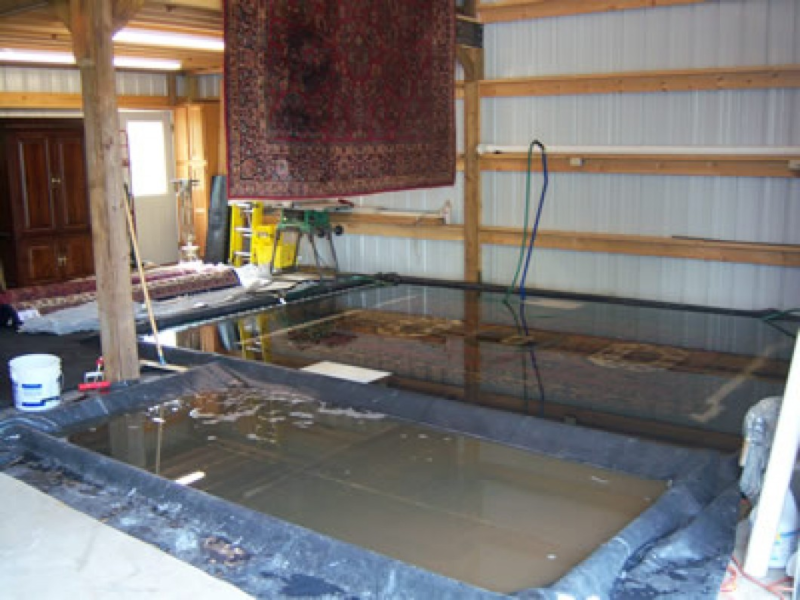 Most rugs are cleaned with a deep water extraction or with rug spa submersion especially designed to get maximum cleaning while protecting sensitive natural fibers. Our cleaning specialist will give the rug a final inspection and release it for delivery..
Rotation: To insure even wear, your rug should rotate once a year. Depending on the traffic, the rotation may vary from six months to two years. Vacuuming: Oriental rugs, like most carpeting, should be vacuumed on a regular basis to remove dirt and restore life to fibers. Be sure not to vacuum the fringe with your beater bar! Use the end of a vacuum hose from a canister vacuum. Padding: A quality pad used under your rugs helps protect it from dirt, wear and slippage. First, soak up the excess liquid by blotting with a clean absorbent material. Do not brush or rub the stain. Then spot-clean with a mild detergent-white vinegar-water solution. Do not over wet. Rinse area thoroughly with water and a small amount of vinegar. Avoid wetting the rug's backing. Blot dry until most of the moisture has been absorbed. Allow to air dry. A fan or cool hair dryer can be used to hasten the drying process. For stains that do not come out using these methods, please contact us.